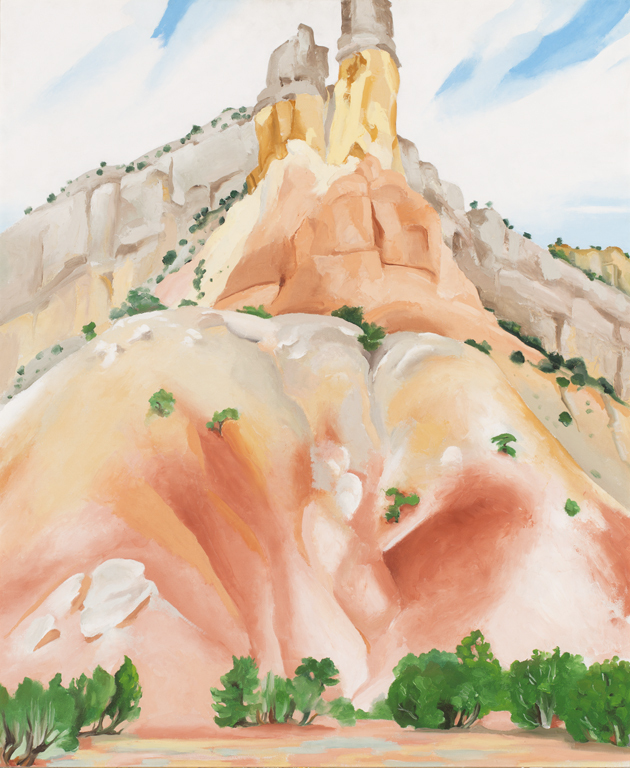 When I was in school studying art, long before experiencing this astonishingly beautiful place up close and personal, I sometimes wondered why Georgia O’Keeffe chose Ghost Ranch and Abiquiu above all others to claim as her home. What made it so special that she knew she belonged there? Why was this her forever home? She’d lived in other parts of the Southwest. She knew Taos and Santa Fe. She’d lived in New York and traveled abroad enough to have her pick of any gorgeous inspirational places to settle down. And yet she became part of such a remote place … in the desert. What’s to do there? Wasn’t it blazing hot in the summer, full of tumbleweeds and lizards? Silly young thoughts from when I lived in the lush green Midwest. 360 degree views of an amazing variety of textures, uniquely shaped cliffs and canyons, wide open desert. I could see how an artist could paint here for a lifetime and never be at a loss for beauty … as the lighting and seasons changed to offer more inspiration for preparing a palette. She loved that micro-mesa mountain so much that she once wrote to a friend, “Pedernal is my private mountain. God told me if I painted it often enough I could have it.” After she passed away, per her wishes her ashes were scattered at the top. … and checked into one of the Coyote rooms, on top of the Ghost Ranch mesa (a different mesa across the valley floor from Pedernal) with views of the ranch and the bluffs. Coyote, room No.3 … our view. Doesn’t the top part of the screen door look like one of her framed paintings? A few yards away, the outdoor Worship Area. We sat here for a while to just ‘be.’ The few people walking about or sitting on Coyote’s veranda all spoke in a whisper. Ghost Ranch does that … inspires you to speak softly, and maybe feel a little guilty to snap a photo and disturb the silence. But I couldn’t resist taking a few pictures. This place is the polar opposite of where O’Keeffe moved from … New York. If an artist ever needed to clear their mind and remove any foggy thoughts, be done with the big city or seek a place to heal and create … this is it. As the sun set we walked around the grounds. View looking down on the stables. … so I could climb up the hill and see this! It was time for dinner and we remembered the Abiquiu Inn and Cafe from a past trip … a scenic 20 minute drive southeast. We enjoyed crispy beef tostadas with avocado, beans, romaine, jack cheese, pico de gallo and chipotle cream. They also have a lovely wine list (the Abiquiu Chardonnay tasted like honey). The inn also has a very nice gift shop. (Tip to the traveler: be sure to get a clear answer as to their return policies and that if something is marked 20% off that they abide by that. We had some difficulty with this having not checked our receipt until we returned home, and then learned that there were no refunds). We changed into our pajamas and read books. Still compelled to whisper. And slept more soundly than we can remember. Next morning … light streaming into the sitting area. The room was very clean, minimalist, with warm radiant heat floors. A chair outside the door … perfect spot for enjoying the cool morning air and a good book of positive affirmations to start the day. Breakfast was served in the large, cafeteria style dining hall below the mesa. A buffet of eggs, fruits, sausages, green chiles and breads. Most of the guests there were taking one of the Ghost Ranch Workshops, as it is now an artist’s and spiritual retreat. We checked out of our room by 10 a.m. and went to find the labyrinth because we have a rule that one must never pass up the chance to walk a labyrinth. We’d heard that this one was one of the most picturesque. We walked along the road of the Lower Pavillion, past the tiny O’Keeffe Cottage where she stayed when first visiting the ranch … not her large Ghost Ranch ‘Rancho de los Burros’ winter home that is still a private residence so it is not open for tours (as far as we know). She stayed here (pictured) and in other adobe cabins in this area of the ranch before building her two houses, and some are open for guest stays. Here is a link to ranch tours … the Landscape Tour, a Walk in Georgia’s Footsteps, and Landscape Trail Rides in the morning and at sunset. Ghost House, built in 1881. The library … built by the family of Johnson & Johnson pharmaceuticals. Library sitting room. They offer books and videos. You can get wifi service here, and there are two upstairs rooms for guest stays. Take your time here … pause to look up and around you. By the time you reach the center your mind will be free of anything bothersome. People leave charms and build small cairns on and around the center stones. When you walk out, the reverse of your steps, your brain will align and you’ll feel a wonderful balance and lift of energy. The trail ascends quickly, before you know it you’re high above the buildings and stables. Chimney Rock … this will look very familiar to O’Keeffe fans. Looking to the right, from the top. These cliffs may also look familiar, from My Back Yard painting. Looking down from Chimney Rock is the large adobe O’Keeffe House and studio, situated in a private area well away from the welcome center and other cabins. The closest point to Chimney Rock. Mr D. grew up in the Mojave Desert. He described this landscape as feeling like home, yet more magical and special. To see the beauty in the desert takes a caring eye, because it is there in the smallest of details… a single tiny flower sprouting from the dry cracked earth, to a blue bird perched on a dried limb. But Ghost Ranch’s landscape and colors are beyond compare. To finally reach the top where chimney rock stands is breathtaking. You are high on the ridge with astounding views, and you pause and feel a sense of gratitude that such magnificence has been created. As you descend the trail you can look back and see just how far at the top of the ridge you actually were. After the hike we took lunch to-go from the dining hall. This was our view as we dined on the front patio of the Welcome Center, and then we began the drive home. It was hard to say goodbye. Because now we know. You described Ghost Ranch perfectly. Thanks for sharing your experience with others. Remember to visit our website GhostRanch.org, to sign up for enews where we share information about upcoming events. Anna, thank you for the info … we’re so excited to take a workshop! I feel like I was there with you. Sandy, thank you! If you ever want to go … I can put your itinerary together. And you will love the Abiquiu O’Keeffe house tour as well.